It’s not about being against foreigners. All nations put their people first. If there’s hard work to do in the world, they turn to the U.S.A. The Left hates President Donald Trump for many reasons. One of the most important is because he really believes in America first. He doesn’t just say it. He bases his policies on that principle. It’s nothing against foreigners. They put their people first. They don’t provide the U.S. with “foreign aid.” They don’t protect America from foreign enemies. If there’s dirty work to do in the world, they turn to Washington. It’s about time we were equally serious about taking care of our own. The first duty of the federal government—and states and localities too—is to protect and support the American people. As the Preamble of the Constitution explains, the federal government’s purpose is to “insure domestic tranquility, provide for the common defense, promote the general welfare, and secure the blessings of liberty to ourselves and our posterity.” If we don’t take care of ourselves no one else will. The political foundation of our republic is citizenship. - which means enjoying the benefits but also paying the price of being an American. Becoming a U.S. citizen is an honor, something people all over the world desire. 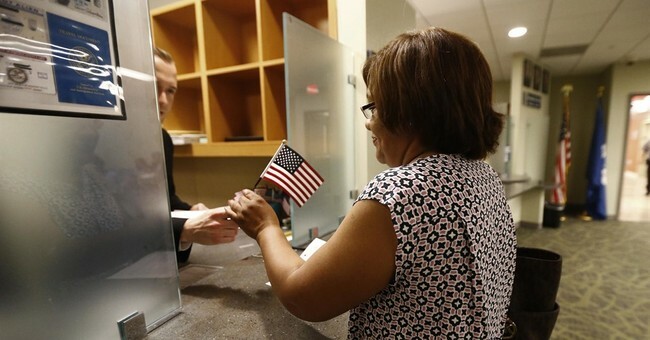 And citizenship is important precisely because it brings full participation in U.S. society. Once you become a citizen—but only then— can you help decide what America is and will become. So naturally only citizens should vote. But, sadly today that idea offends many Democrats, who see themselves as citizens of the world. To them it’s not a problem if you come to America illegally. And not a problem if you vote illegally. Thus, the Left, which includes once mainstream organizations such as the League of Women Voters, works hard to prevent us from learning how many illegal ballots are cast. But the American Civil Rights Union has challenged that activity by filing federal lawsuits against numerous jurisdictions which have more people registered to voter than residents. Where 100-year-olds and 200-year-olds not only are registered but are actively voting. Where people are registered in more than one state. And where non-citizens register and vote, while election officials do little to nothing to remove them from the voter rolls. Even small numbers of improper votes can have significant impacts. President Donald Trump carried the states of Michigan, Pennsylvania, and Wisconsin by especially narrow margins—just .3 percent and 12,000 votes in the first. In Virginia one (yes, one) vote determined the outcome of a delegate contest last November, which in turn determined control of the entire legislative body. The obvious solution is to require proof of citizenship to register to vote. Naturally, the Left calls such a requirement “onerous.” Yet proof of citizenship, most obviously a birth certificate, needs only be procured once. Anyway, the law should apply even if complying is difficult. The majority is cheated—betrayed, really—when illegal votes change the result of an election. Government has no more fundamental duty than to protect the integrity of the electoral process. Unfortunately, a federal court previously blocked an attempt by Alabama, Georgia, and Kansas to add a citizenship requirement to the federal registration form, which otherwise only requires that the registrant swear to be a citizen. Only Kansas was actively enforcing a state citizenship requirement, but that state’s secretary of state, Kris Kobach, is now fighting a lawsuit brought by the ACLU (who else!?) claiming it’s illegal for the state to ensure that those registering to vote are doing so legally. The New York Times even celebrated when the federal judge refused to allow Kobach to introduce new evidence of improper registrations. Critics of election safeguards argue that only a handful of cases of fraudulent behavior have been found. But these are the very people making it virtually impossible to determine the magnitude of the problem. Republicans need to focus on the upcoming election. The Democratic strategy is to use the courts to block election integrity and manipulate redistricting. It could give them victory. Eternal vigilance is the price of liberty, Thomas Jefferson told us. It also is the only defense for free elections. Ken Blackwell is a member of the policy board of the American Civil Rights Union and a senior fellow at the Family Research Council.